The Courtyards at Towne Lake is a beautiful development of Woodstock ranch condominiums with rocking chair porches, garage parking, and lovely grounds. Enjoy all the benefits of a home location close to Woodstock and Towne Lake. The Courtyards at Towne Lake is also just a short drive Hobgood Park, Lake Allatoona, and Red Top Mountain State Park. Commuters have ready access to travel routes along I-575, and I-75. Community amenities include a pool for the enjoyment of homeowners. 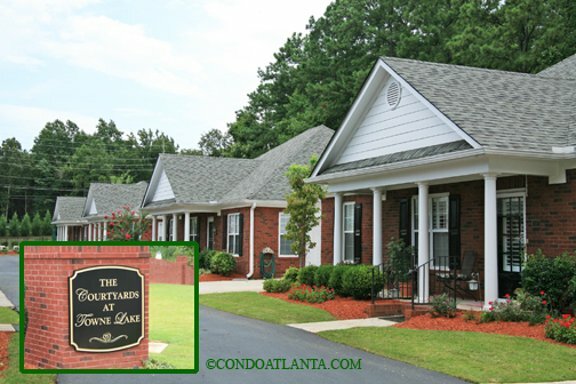 Atlanta Ranch Style condominium homes enjoy the look and feel of single-family style residences with the benefits of condominium living! The architectural designs resemble more traditional house-homes and include garage parking. The interiors feature contemporary upscale floor plans with lots of windows, open floor plans and more! Most offer one level living with a master-on-the-main, lovely, generous kitchens, spacious living rooms, sunrooms perfect for coffee and conversation, and patios overlooking beautifully landscaped green spaces. Ranch style condominium communities also include varied amenities packages… Many include clubhouses and gathering places for those who enjoy an active lifestyle as well as gated security! Some also include swimming pools, common areas outdoor grilling and picnic parks, arbors and sitting spots, pet walks and even putting greens!